Hello everyone! Maria here on the blog today. Have you joined our Blog Hop to benefit the Coffee Oasis Youth Program? Collection is currently open and all you have to do is make a winter-themed project and link it on the site, or leave comments on each participants blog and you will also have a chance to WIN! Simple as that! 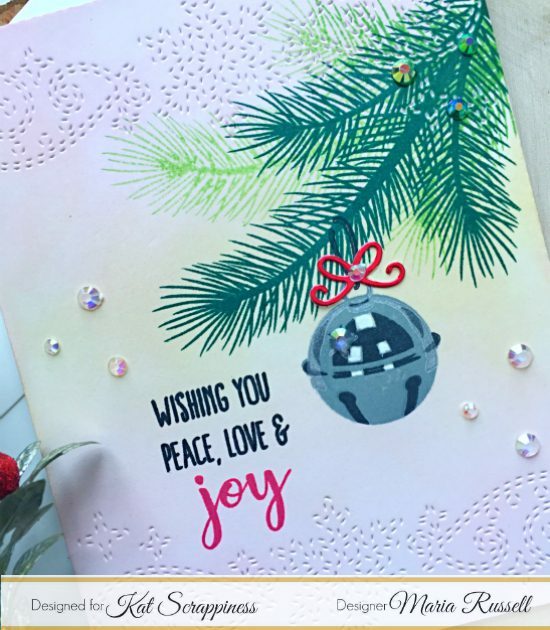 For my card today, I am showcasing the new Stitched Snowflake Swirl Border Background die and other products available at the shop. I started out by die-cutting a piece of some Bristol smooth white card stock using the Stitched Snowflake Swirl Border Background die. I inked up this piece with Spun Sugar and Antique Linen distress oxide inks with my mini-ink blending tool. 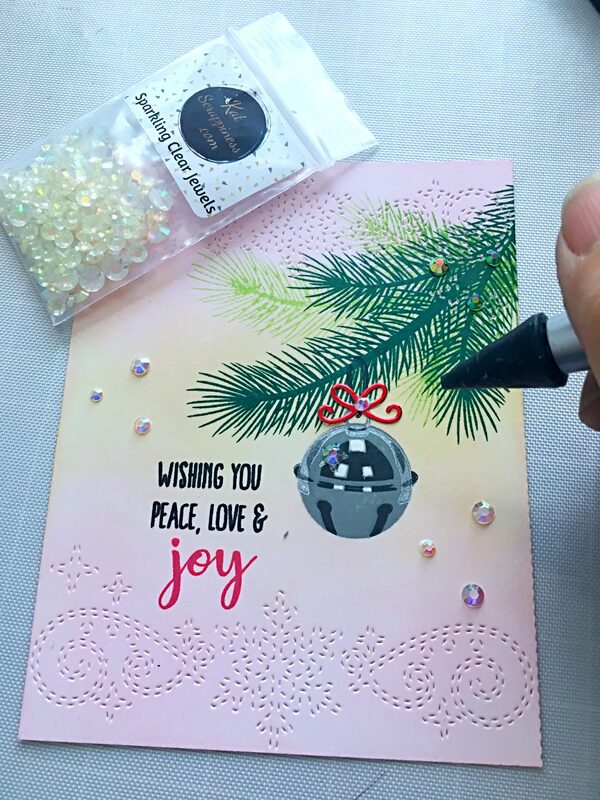 Using the Holiday Style stamp set from Sunny Studio Stamps, I stamped the pine boughs first, then positioned the silver bell ornament and stamped it with different gray and black inks. I also stamped it with some Encore silver pigment ink. I die-cut a piece of red bow using a die-set from Lawn Fawn and adhered it onto the top of the ornament. 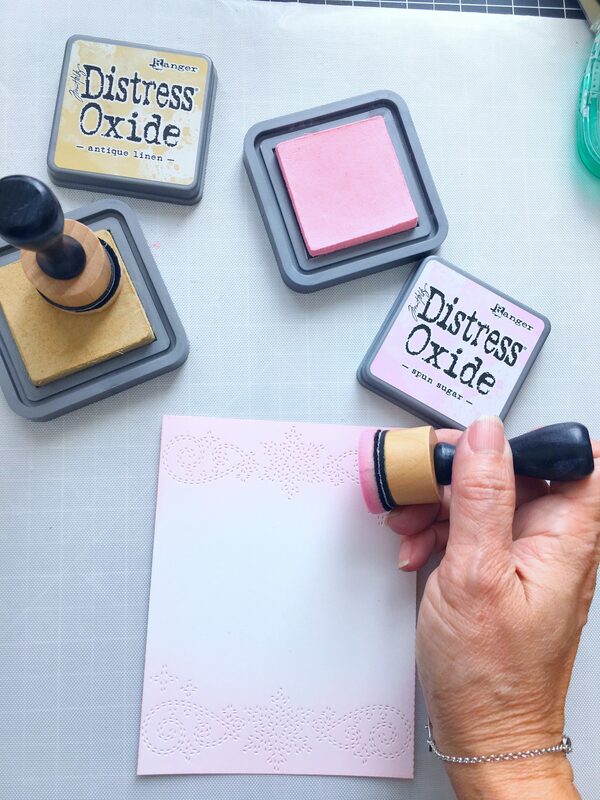 I also stamped the sentiment using Versafine Onyx Black ink and Lawn Fawn Lobster ink. I added the Sparkling Clear jewels using my Crystal Katana jewel picker. 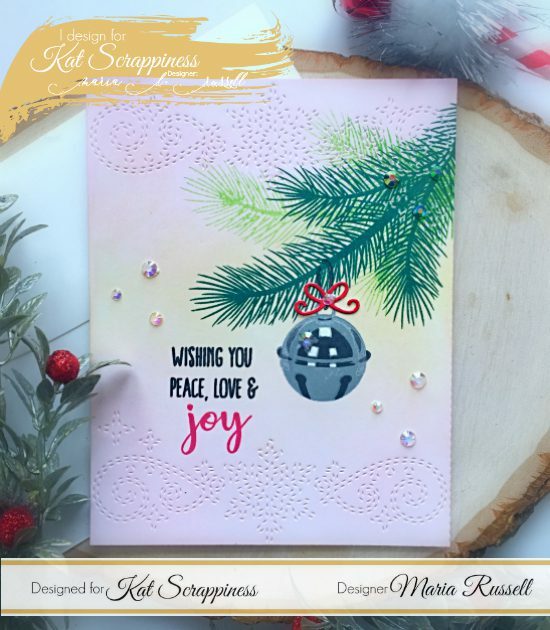 In my opinion, Kat Scrappiness makes the most beautiful and affordable dies. I can’t even pick a favorite because I love them all! Please tell us which one is your favorite die from the shop. I hope you like my card today. The supplies I used are listed and linked below. Don’t forget to use my coupon code “MARIA10” for 10% off your order. Thank you for stopping by and happy crafting!